Beijing Hongluosi is situated at the southern foot of the Hongluo Mountain in the north of Huairou district, which was originally called Daming Si. It was renamed of Huguozifu Si during the Zheng Tong reign (1436-1449) in the Ming Dynasty. However, it has been commonly known as Hongluosi. The temple was initially founded by an eminent monk, Fo Tucheng, in the Christian era 338 of Xian Kang reign in Dongjin Dynasty (317-1644). Hongluosi covers an area of 800 hectares; the scenic spot is a good choice for one-day tour. The whole scenic area is composed of three cultural areas (the Hongluosi, the Guan Yin Temple and the huge stone Buddha ) and two natural attractions (the Hongluo Mountain and the Qinglong Mountain). This is a wonderful destination blooming flowers in spring, spend a cool holiday in summer, enjoy the splendid leaves in autumn, and visit bamboos and plums in winter. Hongluosi is embraced by the Hongluo Mountain in the north and Hongluo Lake in the south. Rolling hills stand in various shapes, dense forests and towering ancient trees are thriving, and grey tiles and red walls of the buildings are all faintly visible in the ocean of bamboos and pines. Three scenic spots dot around the temple, namely the “imperial bamboo forest”, gingkoes in pair” and “pines entangled with wisteria”. With an area of about 66.6 hectares, on the east of the temple the ancient pinewoods there is interspersed with the statues of maitreya, and the twelve symbolic animals. 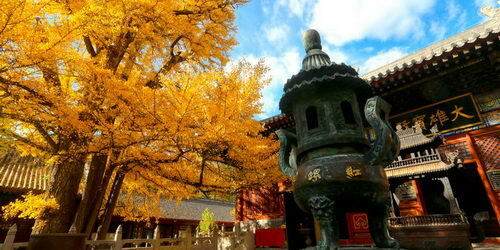 The painted pavilions and corridors, the Guanyin Temple, hidden in the valley, will present you with a wonderland. Welcome to “Hongluo landscape , the pure land of Buddhism”.